Don’t call them a collective. Don’t even call them a hip-hop group. “We’re more of a legion than anything,” states Mike Mictlan of the Minneapolis, Minnesota hip-hop legion known as Doomtree. Since 2001, Doomtree has been laying down beats and lyrics in the Minneapolis metropolitan area to an ever growing hip-hop community. 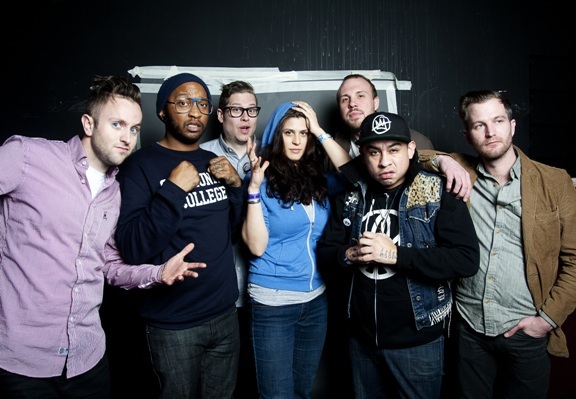 Consisting of seven total members, Doomtree’s sound envelops several different musical styles, including punk rock. Most recently, they self-released the album No Kings, gaining mostly positive reviews from a wide variety of media outlets. As Mictlan puts it, the making of No Kings took on biblical proportions — well, sort of. I know when I think of hip-hop communities, both the West and East Coast come to mind — not Minnesota. But along with other hip-hop acts like Atmosphere, Doomtree have help build a thriving community of hip-hop and rap enthusiasts in the Twin Cities area. Each December brings what is known as the Doomtree Blowout, where the entire group takes to the stage at the First Avenue music venue in downtown Minneapolis. While New York has its set of bragging rights for their hip-hop community, don’t discount the camaraderie in the chilly Midwest. The love for live shows in a place like Minnesota makes perfect sense — enjoy some live hip-hop while warming up in a sold-out music venue. But if you doubt the love for Doomtree outside of their local community, you should check out their touring schedule for 2012, including a stop back in March at SXSW in Austin Texas. And while SXSW seems like a musical paradise for enthusiasts and concertgoers, it can be a daunting task to play. While not yet on the mainstream scene, Doomtree has become established as a heavy-hitter in the indie hip-hop scene. Playing tours nationwide and having devout fans, including some who have tattooed the “teeth and wings” Doomtree logo — a logo that almost wasn’t. With a community of hip-hop enthusiasts and other local artists, the addition of more crew members to Doomtree is a definite possibility in the future. With the group bringing together various different musicians and artists from the Twin Cities area, the option to expand Doomtree or promote other acts is always an option, though not exactly needed in a musical sense. With 2012 in full swing, Doomtree sets their sights on the future. With tour stops in Europe and their annual Blowout in December, things can only get better for the septet.